Klick begin the refurbishment process by having an open discussion with those who will be using the space the most. For example at Cadogan House Prep School, an all girls’ school, the staff decided to create a science laboratory where the girls, in particular, would enjoy the fun bright colours. We spoke to the staff in detail and discovered an additional issue was storage provision and this became a priority when defining the brief. At the initial stages of the project, we recommend creating a wish list detailing your priorities. 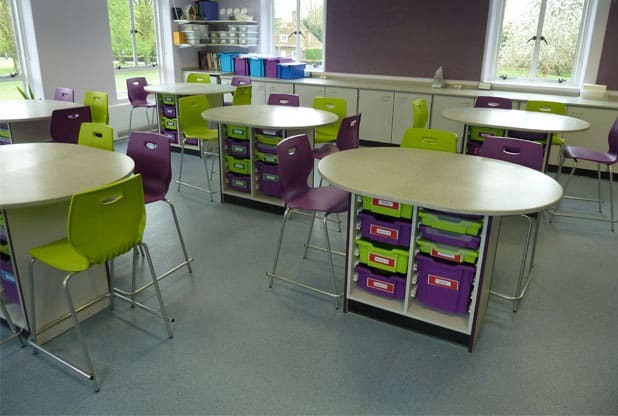 We have numerous case studies on our website to help provide you with some design inspiration for your school refurbishment project. Once we have an idea of how you would like your space to look our designers will discuss in detail your expectations for the room and provide CAD drawings. These drawings will give you a clear idea of how your rooms can be transformed into a practical and well designed laboratory. During this process, we will also discuss colour and material options and provide samples to assist you in making decisions. These will be selected in line with your specification and budget. Our project management is what sets us apart and gets the room back to you quickly and efficiently, with every step planned in minute detail. As part of the process, we will check if current gas, power and water services are adequate for the proposed refurbishment. If you are not happy with the current configuration of the space we will also make suggestions on how to improve or change it, based on our initial survey. This is dependent on the structure of the building and any service limitations. We will do our very best to reconfigure a space. 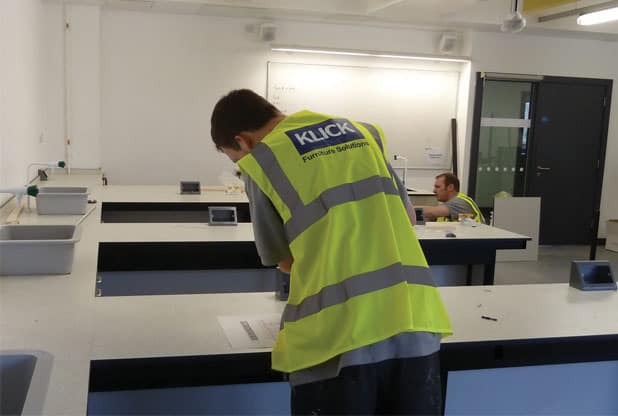 For example, at South Cheshire College we removed a wall to combine two teaching classrooms to create space for an impressive new science laboratory. 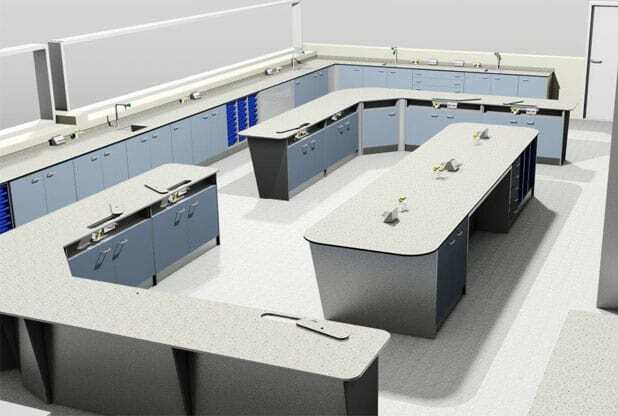 Once the design, layout and materials have been approved we will instruct the laboratory furniture to be manufactured. Preparatory strip out work can take place during this time if required. When on site we aim to work up to a 12 hour day to ensure we finish the project as quickly as possible for our clients, therefore minimising disruption. Quality is one of our top priorities and is something we are renowned for. We ensure all individuals that will be on the premises have the appropriate training, qualifications and certificates. Our electrical engineers are NICEIC registered and our plumbers are Gas Safe registered. The refurbishment team complies with all health and safety requirements in line with ‘The Construction (Design & Management) Regulations 2015’. Klick is also CHAS and Constructionline accredited. All Klick employees are DBS checked to comply with regulations. In addition, the company’s overall quality management system has been approved to the ISO 9001:2015 standard. Where possible we complete snagging as the project goes along and aim to have minimal snags at the end of a job. Any outstanding issues will be dealt with promptly, at your convenience. Our project management team are always out and about and will aim to assist as soon as possible. If there is a serious issue with electrics or gas we aim to fix this on the same day or within 24 hours. Once the project is completed we will ask for sign off. We like to take photos of the finished space for our records as well as yours. All Klick Technology furniture is guaranteed for a period of two years from the date of installation. Mechanical and Electrical services also carry a two year warranty from the date of completion. Once a project is signed off we never forget our clients and continue to provide a comprehensive aftercare service. 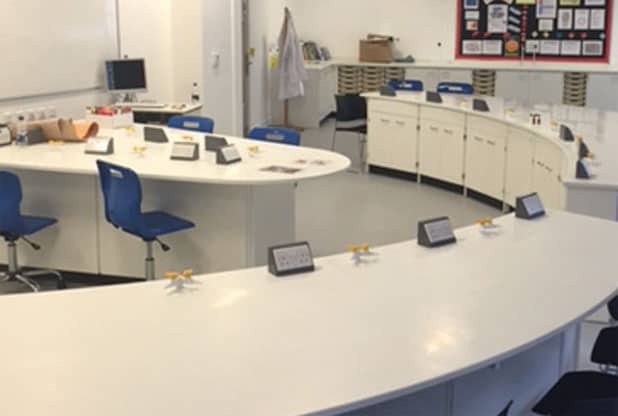 New from old: Transforming secondary schools through refurbishment. If you would like advice on a school refurbishment project I would be happy to visit and discuss your brief. Please email me or call today on 0161 998 9726.